We have now made the official handover to the past secretary of the association, Elspeth Farmer, seated next to Steve Blackett with the plaque now in its full, central position. Seated next to President Gillian is an old face from the Club. Yes, it's .................... Andrew Still. 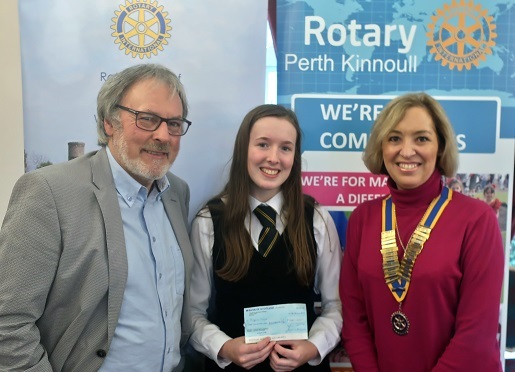 The Club have agreed to donate money to Katie Hughes from Perth High School as part of her finance for her Chilean trip. 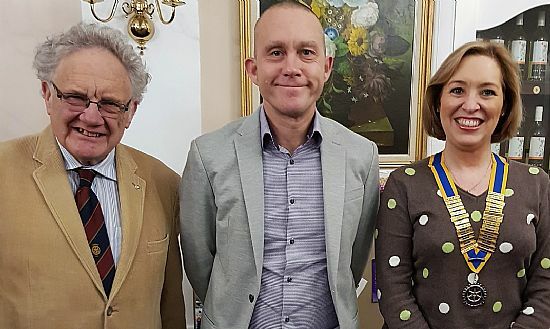 She appears in the photo with Convenor Chris Kirk and President Gillian. 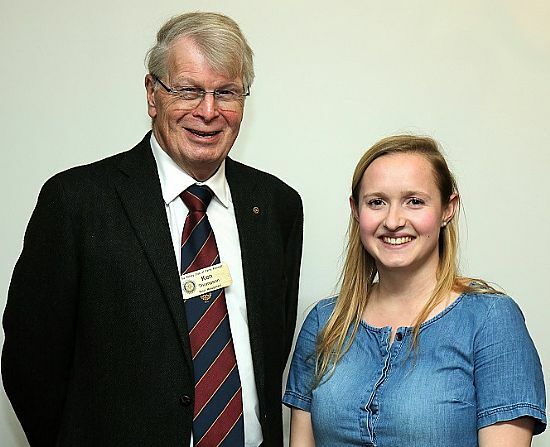 Katie has organised her trip for a year to teach English to primary school children in Chile. She hopes to build on her own Spanish language skills at the same time. It is the idea of being in a new and exciting country that she understands will be challenging but extremely worthwhile. 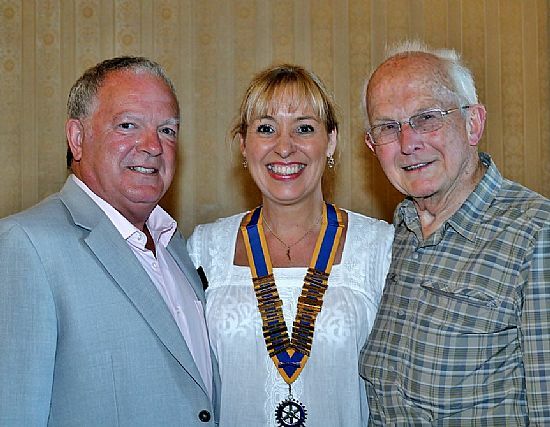 The Club has a part to play in supporting the Rotary pledge for the advancement of education in developing countries. We are sure that Katie will take this once in a lifetime opportunity to immerse herself in Chilean culture and return to tell us the tale. Elaine Cameron gave a sound explanation for all the work that she has taken on with refugee families in Perth. She was accompanied by Iman Sari from Syria who has been settling in Perth for around three years. Elaine, a career teacher from Ireland, is a member of St John’s Episcopal Church in Perth and is very involved with the welcome to refugees and the setting up of the International Café. It was here that she became involved with the UK Government program for vulnerable Syrians, a scheme which allows for five years of support and care before they can decide on their own futures. There are seven families on the scheme with between eight and ten volunteers on the refugee integration strategy. Iman spoke very well about her life in Aleppo in Syria and the sudden misfortune that overtook her family. She tragically lost her husband while her brother is in Turkey and her sister in the Lebanon. Keeping in touch is so difficult. Studying cookery at Perth College has brought her to the community where she finds everyone nice and friendly. The church groups have been taking the families on trips to visit the Scottish cultural areas. Finance from the local council has been basic to improve the English language of the families. Imran has three children who are settling at the school and becoming happier and more relaxed with time. Of course, she would like to visit with her family in Turkey at some time but, for now, she feels safe and happy and enjoys life in Scotland. She was very sincere with her thanks to the Membership which was reiterated by Greg Ross in his vote of thanks to both speakers. Drew and Helen McKenzie Smith gave a presentation on their recently completed project Lindores Abbey Distillery. The intention has been to create the whisky brand associated with the oldest recorded production of whisky then called Aqua Vita. 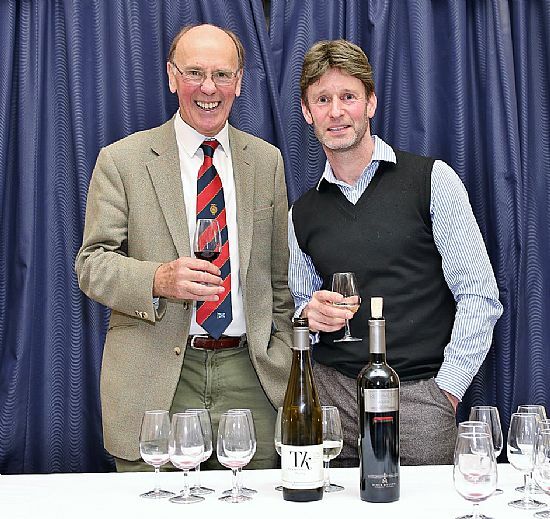 Drew, from the Howison family who own Lindores Farm, calls himself the custodian of the lands and so places his feelings squarely in the public eye. Lindores Abbey, founded in 1191, has an entry in the Scottish Exchequer Rolls understood to be the first ever mention of whisky. Drew also explained how the area is to be brought back to early cultivation methods as a homage to the Abbey. A large acreage of orchard trees has been planted and the distillery is also setting up bee keeping. 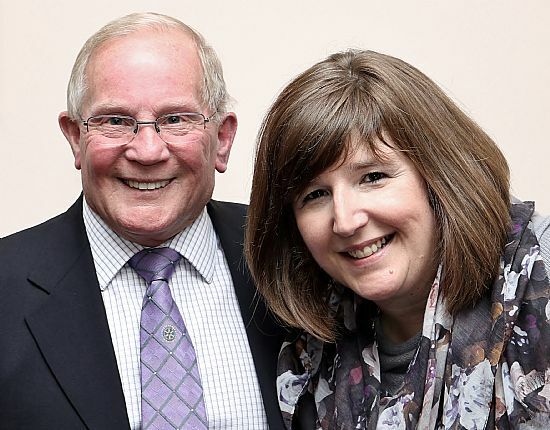 Such a glance to the past has given the whole process a complete identity in the town of Newburgh and the Club wishes Drew and Helen the very best for their future success. 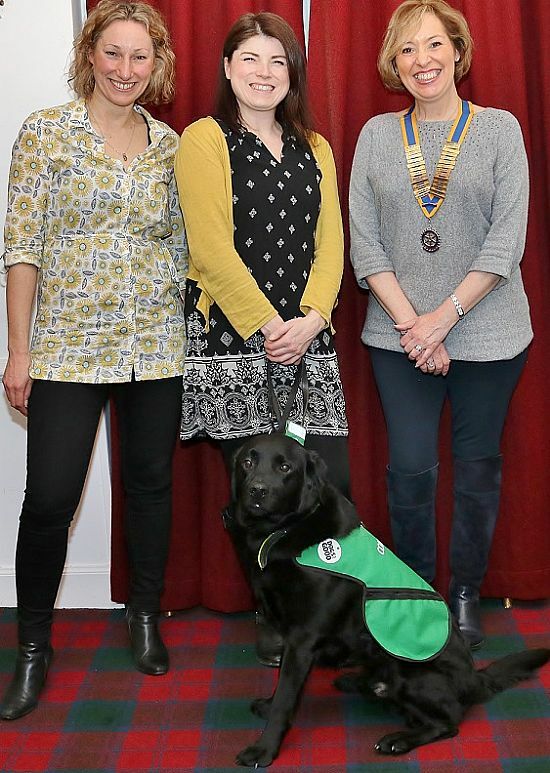 We welcomed Fiona Corner and Carla Mounsey from the Dementia Dog Project for the evening. Fiona, the project manager based at Castle Huntly, explained the origins of the project as a pilot project called Assistance Dog in 2011. The current project grew from this initial interest and has been running since 2016 with then training of eight dogs at Castle Huntly. Each dog is trained to accompany a dementia patient who is not in full-time care. 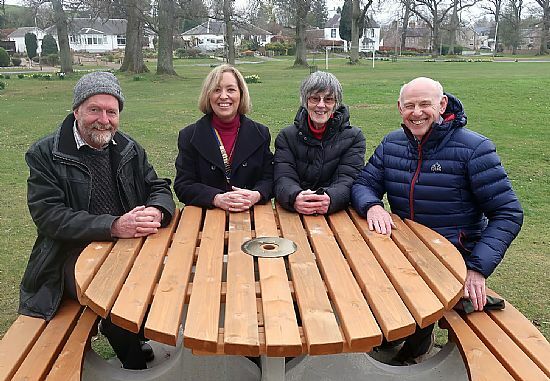 This is hoped to restructure the routine of the patient who can gain confidence, become a social connector in public and provide an emotional anchor at home. The dog is kept on a dual lead for walks in the community and this has been shown to boost confidence, independence reduce social isolation. Carla was accompanied by one of the trained dogs and demonstrated the abilities of the dog to support a patient. What was a fun exercise did show the seriousness of the situation for dementia patients and was welcomed by the Club Members. We had a very welcome return visit from Drew Watson and Pierre Leger of the Strathearn Cheese Company. They gave the Members an update on their three-year-old business as they have expanded the products and production methods. 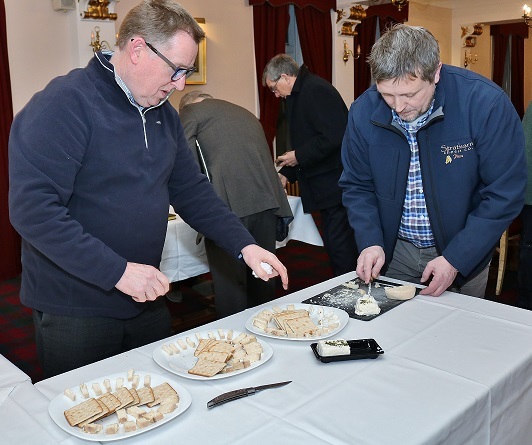 The members were also treated to the three cheeses; Lady Mary, The Strathearn, and the new Wee Comrie. Pierre outlined the need for the new routines as the company begins to sell to customers directly and deliver to farm shops as part of the company expansion. The existing wholesale business and their presence at farmers’ markets are very time consuming but a necessary part of the company development. Like all businesses, price rises in the raw materials mean they have to be very aware of market forces. Pierre and Drew were pleased with the reception of their new cheese, the Wee Comrie, which achieved a bronze medal at the Highland Show. Janet Simpson, their host for the evening, thanked them both for their enjoyable talk and their time from such a busy schedule. 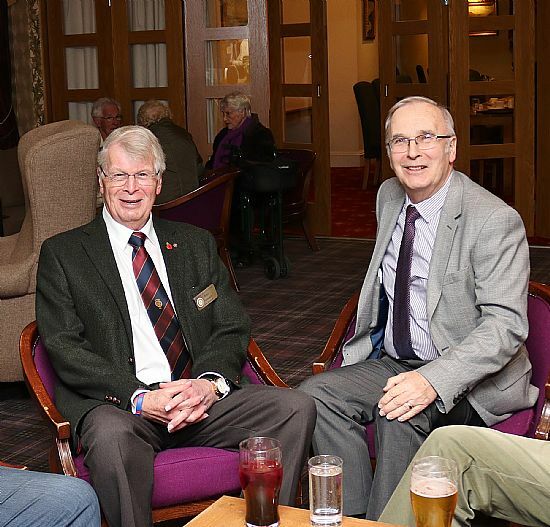 Back row (L-R) John Holme, District Assistant Governor; Iain Mackintosh, Perth Burns Club; George Delgaty, Perth Kinnoull Rotary. 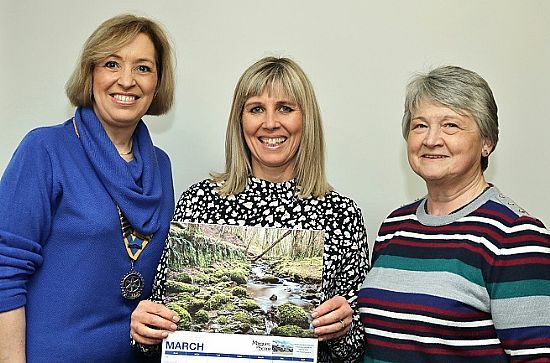 Front row(L-R)Estelle Nicol, Perth Burns Club and Auchterarder Rotary Club; President Gillian,Perth Kinnoull Rotary; Joan Allen, Perth Burns Club. Alan Imrie was a very welcome guest this week with further news of Scots lives in London or, as he phrased it, thistles among the roses. 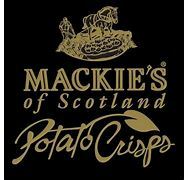 His talk was motivated by a tea towel of Scottish inventors which prompted him to think of other famous Scots in London associated with the Crown Court Church. Alan began with the story of James Braidwood created Master of Fire Engines in Edinburgh in 1824. Braidwood was so successful that he was brought to London in 1833 to set up the London Fire Service. Ironically, Braidwood died in a fire in 1861 as he was a man who led from the front. Alan followed with the story of Lady Frances Balfour, the daughter of the 8th Duke of Argyll, who was a liberal speaker and lobbyist on the rights for women. She was responsible for raising the funds for rebuilding the Crown Court Church. Her husband Eustace Balfour, brother to the British Prime Minister Arthur Balfour, was Lieutenant Colonel of the London Scottish Regiment. 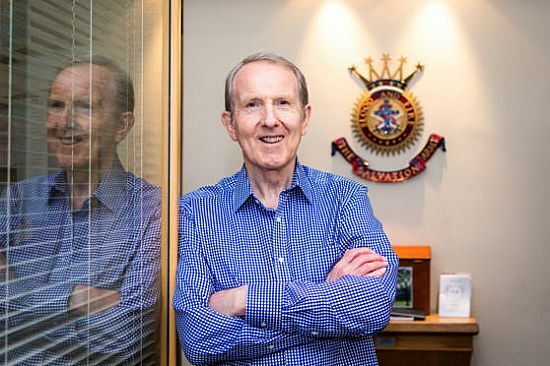 On mention of the London Scottish Regiment, Alan began to involve the Members with photographs of former soldiers of the Regiment with some appreciation of his gentle style. Names of long-lost actors like Ronald Coleman, Basil Rathbone and Claude Rains encouraged the mental acuity of many Members, as did writers like Kenneth Grahame and the better-known Sir Alexander Fleming. 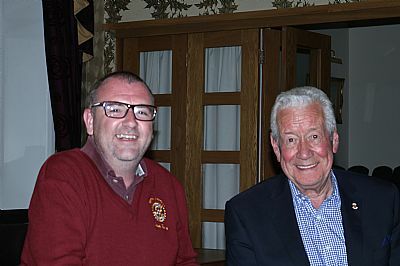 Alan concluded a very enjoyable evening with a foray amongst other famous Scots who went to London including the Flying Scotsman. Simon Phillips of ME Research UK was our guest speaker this week. Simon has just joined ME Research UK as the Chief Executive Officer and brings a wealth of experience in commerce with work at Simply Food and Waterstones. Simon first introduced the Members to the fact that this charity is Perth-based but has global connections. His role, as he sees it, is to make these facts more widely known. He explained that the chronic disease ME is a post exertional malaise expressed as extreme fatigue after any activity. Originally called Yuppie Flu, ME was recognised as an illness by the UN in 2002 and is said to now affect over 240,000 people in the UK and many millions worldwide. The Perth headquarters is responsible for fund raising across the globe to support university projects into finding a cure for the illness known fully as Myalgic Encephalomyelitis or Chronic Fatigue Syndrome. Currently the funding supports forty-eight projects at universities across the world. 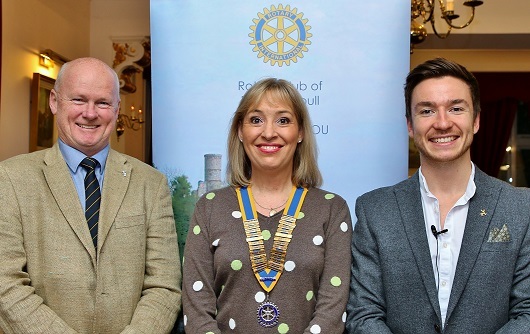 In thanking Simon for his illuminating talk, Rotarian Tom Laurie was clear to point out how this illness was close to many in Perth and he wished Simon every success in expanding the charity’s work. Our newest member, Ken Thompson, gave his job talk at the end of the month. 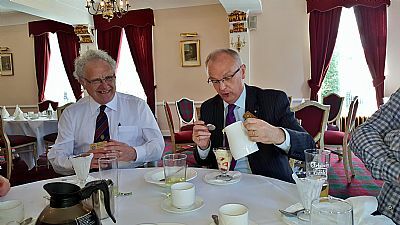 He took us on an enjoyable journey around the UK with his 33 years career with Littlewoods and a mere ten years more as a sub-postmaster in Somerset and Grange-over-Sands. The journey began with some introduction to life as he was offered manager of the Londonderry Littlewoods store. His 13 months provided a list of hair-raising events through being evacuated from the store some forty three times. A more settled part of the journey took Ken to Wrexham, Chesterfield, London, Cardiff and, finally, Aberdeen. 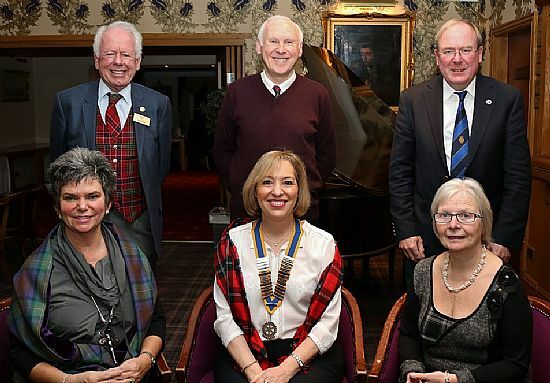 Perth Kinnoull is now his fourth Rotary Club. His first, by chance, was St Machar where he was inaugurated by our own Bruce Cameron, the then president. 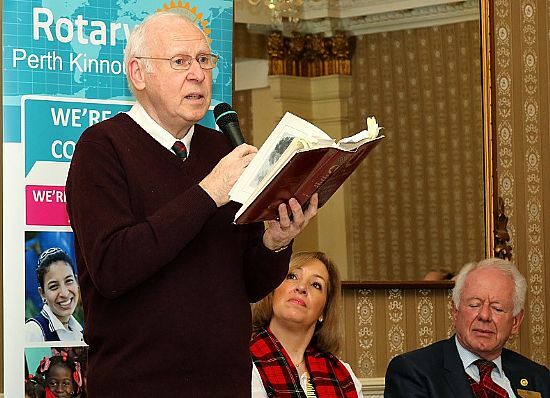 Ken, seated left, was thanked by his host, Iain Brown. Josh Goodey, a member of the Chiropractic Life team in Perth, explained how his personal ambition to create a chiropractic health and wellness program had, at last, been realised. He graduated from the University of Leeds with a degree in sports and exercise science during which time he became interested in the philosophy of chiropractic medicine. Josh recalled how he met patients who were achieving great progress with their chiropractic care but would have benefited from a more extensive care plan. This led him to the idea of wellness whereby a patient could improve their health by combining lifestyle changes with their care plan. He interpreted health as physical, chemical and emotional wellbeing which left untended causes imbalances, develops dysfunctions and leads to well known symptoms of poor health; something which touches everyone today who feels a lack of energy, stiffness and suffers minor ailments. It would be impossible to cover the wealth of detail Josh gave the Members about investigating how well someone actually felt and what steps were necessary to correct those imbalances. Suffice it to say, the Members are now fully conversant in the principles of nutrition, exercise and mindfulness. Josh dealt with a barrage of questions with the authority that had marked his talk was thanked by his host for the evening, Brad Harris, who had some personal experience of the scheme. 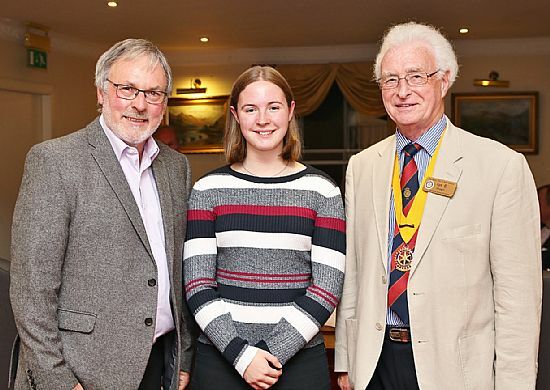 Amy Hatrick (on right) accompanied by colleague Claire Thomson and host Rotarian Brian Raine. 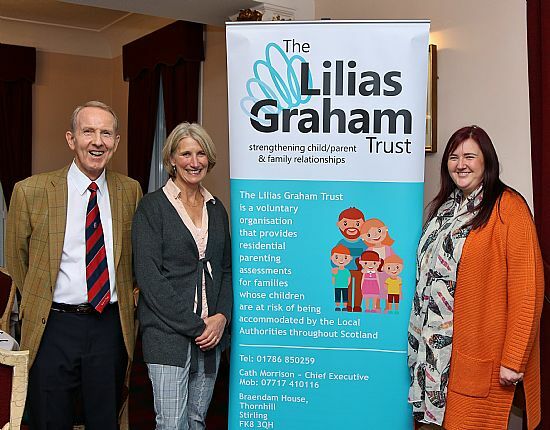 The Lilias Graham Trust is a Scottish charity that offers independent parenting capacity assessments, within a residential facility. 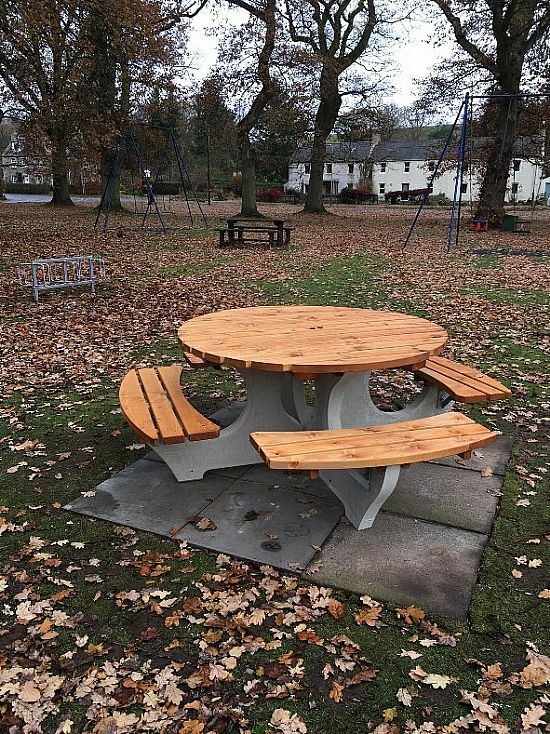 Located in rural Stirlingshire, the LGT provides residential placements to parents and families in cases where there are concerns about parents not meeting the needs of their child/children and the Local Authority require more evidence-based information about whether the child can remain safe within the family. The protection of vulnerable children is the focus. With experienced staff on call 24 hours a day, The LGT provides and assesses parenting skills and helps parents and families to explore and develop positive relationships. Amy Hatrick and colleague Claire Thomson visited us this evening to explain the origin of the charity and the work it undertakes. Amy has worked for the Lilias Graham Trust for the last 5 years and has held the position of Service Manager for the last 4 years. She has completed her Certificate in Child Welfare and Protection at Stirling University as well as a Management Award at Cardonald College. Claire Thomson, who accompanied Amy, is Finance Manager of the Lilias Graham Trust and has worked with the charity for the past 12 years. 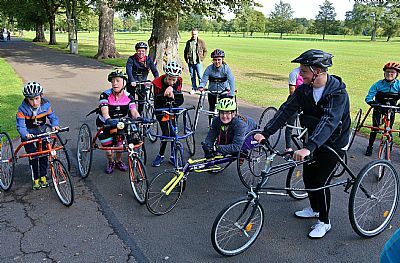 17 September 2018Our Racerunner at the North Inch. Young Strathspey Harrier athletes are pictured before the recent event on the North Inch. Matthew Doig, centre in red, has recently returned from competition in Denmark where he won 4 gold medals and achieved a world record time in his age group in the 1500 metres. To Matthew's left, in grey top, is Niamh Sandeman who pilots the newly-purchased Rotary racerunner. (see pic below). Niamh (Neave) Sandeman with dad Charlie. Niamh aged 17 lives in Longforgan and is studying Life Skills at Perth College. She has been involved with the Racerunners for 3 years and is an enthusiastic member of the club. Every now and then, we have a speaker who brings the real world to life in an exciting way. This was certainly true of Janet Reay, Trading Standards Officer for Perth and Kinross, in her presentation on current scams. Janet has a lot of experience of such operators having worked for many years, qualifying firstly in her home town of Sunderland and latterly in Fife. Since 1996, she has been taking care of the good residents of Perth across a wide range of problems from electrical goods to legal highs. Janet explained that scams were defined as misleading, deceptive or fraudulent marketing offers. Scams are touching everybody and affecting lives everywhere. Janet further added how the vulnerable people in our society were being preyed on mercilessly by sophisticated operators. The effect is to cause social isolation and embarrassment. Scams have become more evident since the wide use of the internet made people more available to contact from anywhere in the world. They fit into one of three categories – bogus letters, telephone calls and e-mails. Janet detailed the problems with each category and the best way to deal with them; never give anyone your pin number as that action breaks your contract with the bank. Her talk provided the Members with practical guidelines and useful tips with a list of phone numbers for further help and advice. Lastly, Janet explained how she had set up a special unit to identify who is being targeted by the scammers. The problem here is that people can be drawn in and become addicted. 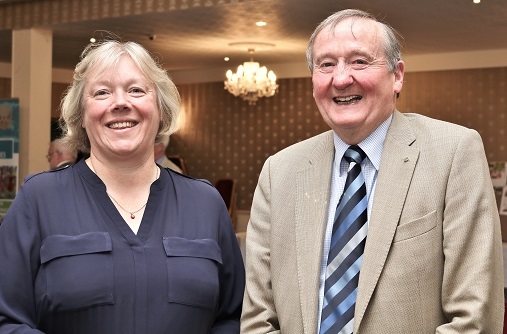 Her work has been very successful in supporting many people in Perth, work that was very much appreciated by Bob Reid as he thanked Janet for her talk. 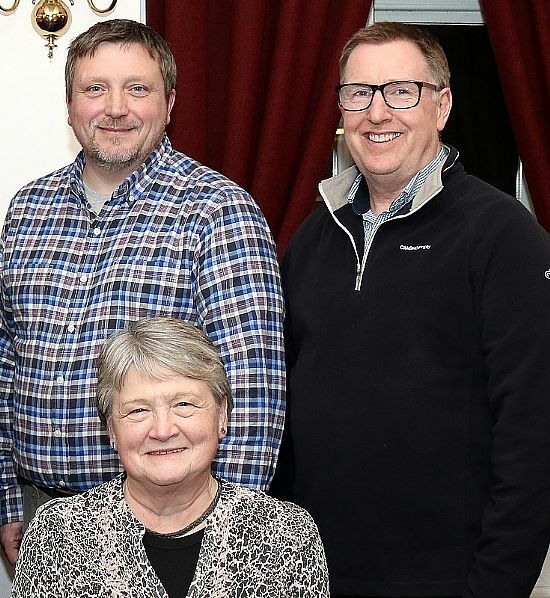 Sue Hope spoke to the Club members about the Foundation’s work in Sierra Leone, Kenya and Malawi to bring comfort, relief and support to women disabled through childbirth. Sue explained the dramatic consequences that affect one woman every three seconds; an appalling figure highlighting the ignorance and neglect shown towards the sufferers. 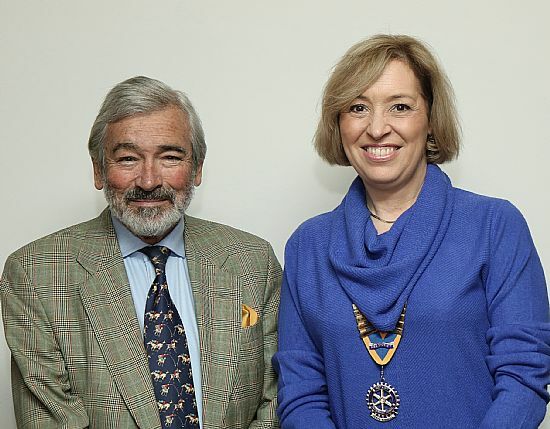 The Foundation set up in 2008 by Ann Gloag seeks to expand the early work with the help of Rotary and the United nations. Although the Foundation gives medical support to the sufferers, it has provided a means of reintegration into society for the shunned sufferers. Just as important is the work to bring about prevention through natural care and family planning. So the Foundation has supported the training of over five hundred specialist doctors and nurses. In Kenya the Foundation supports and funds existing work, while direct intervention is needed in the other countries. Further work includes out-patient clinics which have supported over twenty thousand children to date. Secondly, the work has been shown to be supported greatly by the further provision of literary and nursery classes which give the Foundation more meaning to the holistic approach it has sponsored. 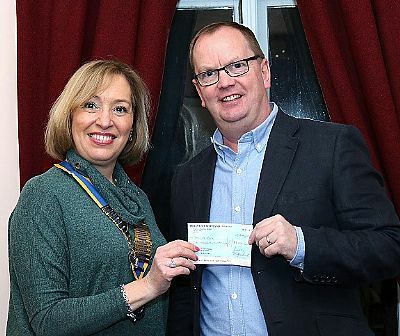 Club Members were very encouraged by the further knowledge that every penny raised is directed towards the sufferers and very moved by a direct insight into the hidden plight of so many women. Sue Hope was thanked by her host for the evening, Colin Moreland, for her time, patience and expertise in explaining the detailed work of the Foundation. Gillian Farnington, seated here front left, spoke to the Members about the Prince’s Trust. After 12 years in the police force, she decided to take a year with the Prince's Trust managing one of the new personal development schemes. The Prince’s Trust began in 1976 with the intention of improving the lives of disadvantaged young people and expanded into schemes for starting young businesses. 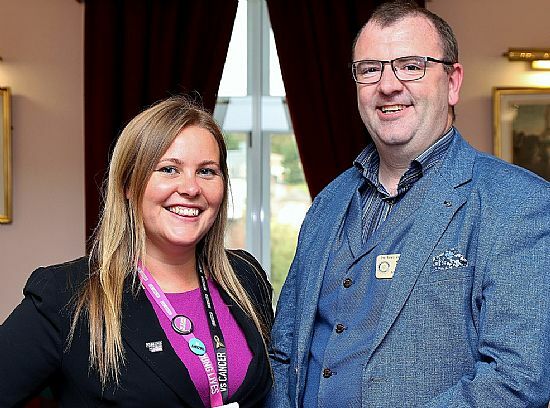 Gillian explained how the latest scheme, centred in Dundee, is intended to tackle rising youth unemployment with the involvement of the YMCA, Perth College, Perth Council and Police Scotland. Gillian is about to start her 3rd scheme and is looking to recruit 16 to 25 year-olds not in full time education. The recruits will face a number of challenges over 8 weeks as well as receiving residential accommodation and a budget. Each week brings new approaches to the personal development of the recruits from team building, community work and running their own charity shop. The final two weeks allow each recruit to have a work placement. The hope is that the young people will be able to stabilise their lives and get back some control of their personal development. 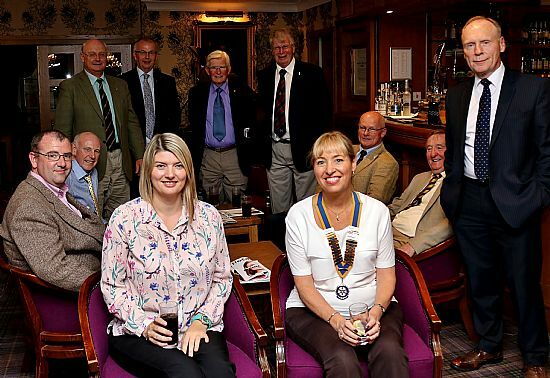 Such a worthy enterprise was whole-heartedly acclaimed by the Members, some of whom are shown here with Gillian and her namesake, President Gillian. It was "Job Talk" time for Steven Fairlie who joined the club on 20th March this year. Educated at St. Ninians Primary (where he sang in the cathedral choir!) and Perth Academy, Steven went on to Dundee University to study accountancy. He joined Norwich Union in October 2003 and has become the Senior Compliance Manager at Aviva specialising in data compliance with the Motor Insurance Database and Employers Liability Tracing Office. He also worked for Wm.Low/Tesco for 21 years - a part time job he had from schooldays that he kept on. He is married to Catriona and has three boys. Interests include football (watching rather than participating!) and, like most dads, providing a taxi service for the boys and various activities they have! 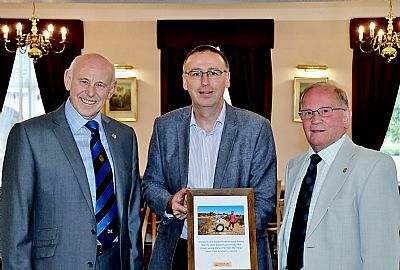 31 July 2018Scottish Rotary Clubs Support Malawi Fruits. Kevin Simpson who is the Executive Director of Malawi Fruits​ paid us another welcome visit this evening following our fourth successful joint organising of the popular and lucrative Tayside Challenge Cycle Sportive which has raised almost £34,000 since its inception. Kevin is the Executive Director of Malawi Fruits; a Scottish charity helping some of the world's poorest people in Malawi through loans and education, helping them to help themselves by growing a cash crop. His organisation is very involved in the upgrading of their farming practices including modernisation, irrigation and local processing of produce. Although he originates from Broughty Ferry Kevin now lives in Wishaw. For a day job he is the CEO of the Sottish Jewish Charity and is the first ever non-jew to run that charity. Kevin is pictured (centre) presenting a photograph of one of the Malawi farmers with his solar-powered water pump. 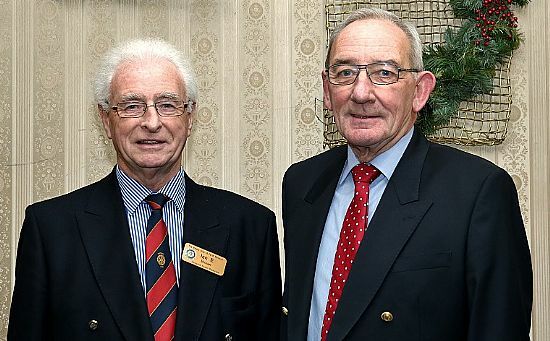 He is accompanied by Steve Blackett on the left and last year's president Colin Moreland. 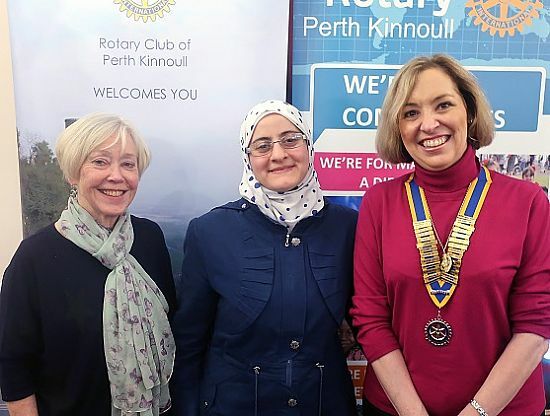 The Perth Kinnoull club was the first to purchase and donate a water pump a little over a year ago and since then, thanks to Kevin's powers of persuasion, Scottish Rotary clubs have donated a further 27 pumps. We were also joined this evening by Elspeth Farmer who until recently was the Secretary of the Pitcairngreen Village Association for 11 years. Dr Samira Bell is a Senior Clinical Lecturer at Dundee University and Consultant Nephrologist at Ninewells Hospital. She holds a NHS Research Scotland Fellowship funded by the Chief Scientists Office studying Acute Kidney Injury and diabetes. 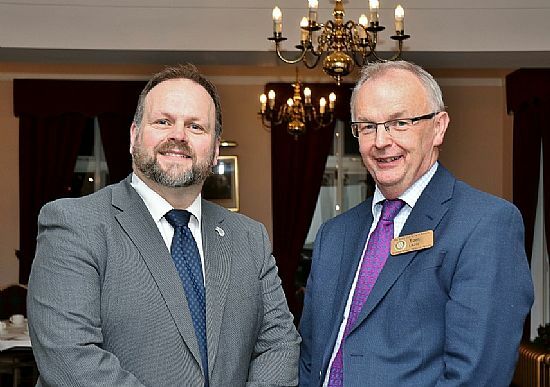 NHS Tayside has become the first health board in Scotland to introduce an electronic early-warning system to identify damage to the kidneys at a much earlier stage, potentially improving survival rates and shortening hospital stays. The system works by flagging up warning signs to clinicians after blood tests. 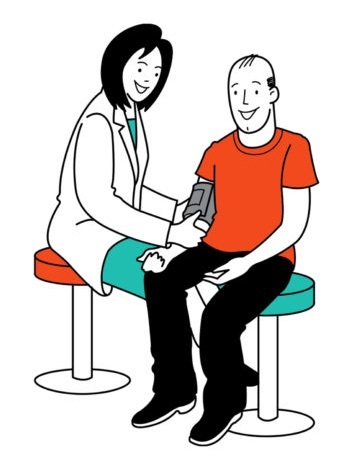 Messages are sent to computer systems holding patient results, clearly outlining to doctors the severity of the injury and information on the best course of action. Samira outlined the hardship of a life on dialysis following severe kidney damage. Patients spend four hours three times a week on a dialysis machine with all the attendant travel, support and time needed for such arrangements. There are also restrictive dietary requirements and limitations to liquid intake at one and a half litres daily. And the side effects can be equally restrictive. So it is no wonder, she added, that a kidney transplant is looked upon with such expectations to health especially with such high survival rates in young patients. All transplants are carried out in Edinburgh with support and recovery transferred to Ninewells in Dundee. She also explained that the new strategies involve several support systems which have been set up to encourage live donors to come forward. Such a move with early clinical diagnosis removes the need for dialysis at all; a much more acceptable and comfortable approach to the whole issue. 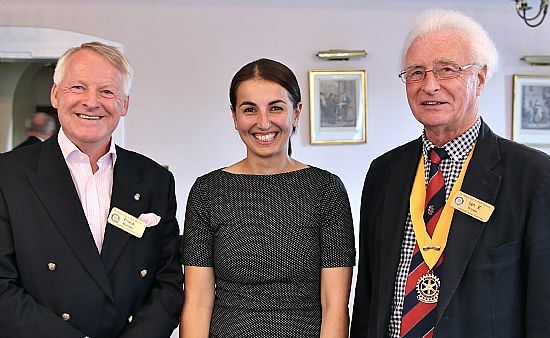 Such an interesting talk on pioneering medicine gave the members much food for thought and Samira was thanked for her presentation by her host for the evening, Frank Muirden, both pictured with Club Senior Vice-President Ian E Brown. 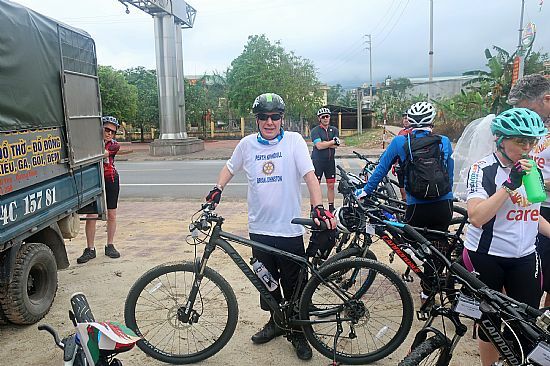 Rotarian Brian Johnston gave the members an insight into his momentous fund raising effort cycling in Vietnam. He was working with ‘Lend with Care’ a charity that raises money to be lent to entrepreneurs world-wide; the money is then paid back or lent to another. 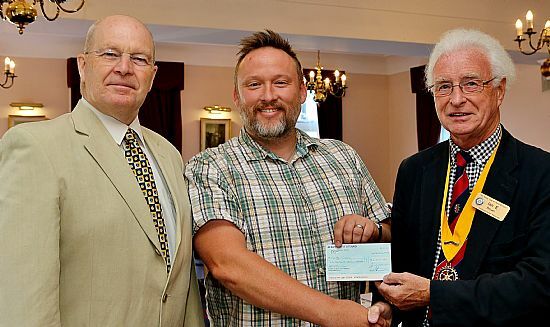 The charity is involved with a lot of Rotary Clubs. Of course, Brian explained, he had to get fit enough to complete the challenge of height and distance. He thanked Lorna for her support on a 79 Km ride, the culmination of working every day for a month in the gym and on the road. He reckoned that he had been covering over a hundred miles a week. 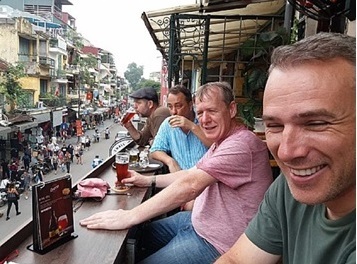 He arrived in Hanoi on 20th April to meet another 16 cyclists who had taken the spare parts like saddles for the bikes which were fitted there by mechanics. The riders were supported by those people who drove support vehicles throughout the ride, especially useful for one of the group, an 80 year old woman, who had an accident on the first day. There were also guides who would explain the sights on the tour and the glimpses of the way people lived in the country. The group were to meet the family of one entrepreneur who was receiving a loan for setting up an animal rearing unit. Brian said he was overwhelmed by the attention of the local people who smiled and waved wherever he went; smiles that remain with him to this day. He soon learnt that there was no traffic control, especially in the cities. Being the monsoon, the wet was an additional hazard on the usually poor roads and the low cloud and mist in the mountains meant visibility was dangerously poor at times. This was compensated for on clear days where the mountain views were spectacular. 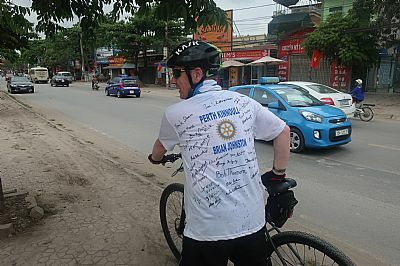 Brian completed 505 km over the 9 days he was in Vietnam and has raised just short of £8000; The group of 17 as a whole raised a stunning £101,000. 18 July 2018Custard on Strawberries? Hot custard on strawberries and ice cream? 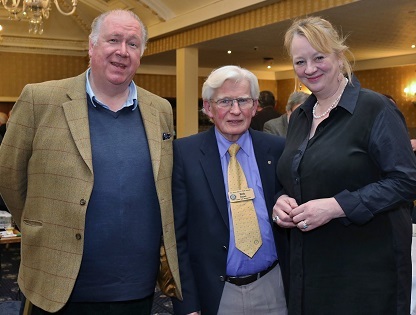 From the left, Kevin Fearn, President Gillian and Ian Strachan, MBE. 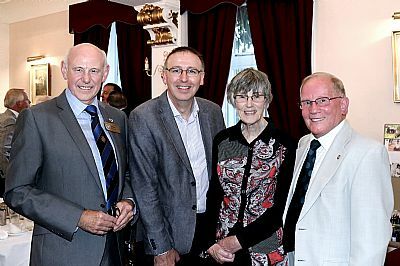 Ian Strachan, MBE, and his wife, Judith, were the guests of the Club on Tuesday 3rd July. Ian transported us back to the days when adventure meant adventure with his talk of the flight he made from Bristol to Malawi in a two-seater Auster Observation plane. His work in the Colonial Service in the fifties and sixties was in the former Nyasaland, now Malawi, and he was District Commissioner during independence in 1964. Eventually he had the idea that a return trip in early 1967 would be a real enterprise. He arranged to meet Graham, an experienced Australian pilot, in Corsica so set off with his future wife Judith from Bristol on 4th January, but got lost over France. Eventually he made Corsica leaving Judith to return to Britain; she kept in touch for the rest of the journey accepting a proposal of marriage en-route. Ian and Graham crossed the Med to Tripoli and hopped along the coast to Egypt and down the river to Aswam, being built at the time, and on to Khartoum, Entebbe, Nairobi and eventually Dar es Salaam. Ian recounted the many incidents along the way for refuelling, sightseeing and maintenance of the plane. Some were quite fun but many gave his audience moments of anxiety. Such a venture was not without extreme danger and Ian, himself, suggested such a trip would not be possible today. However, sharing such tales made for a memorable evening. 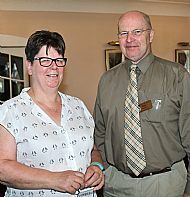 Gill Renton, the manager of Crossroads, Perth, gave a presentation of the charity's work on Tuesday evening. 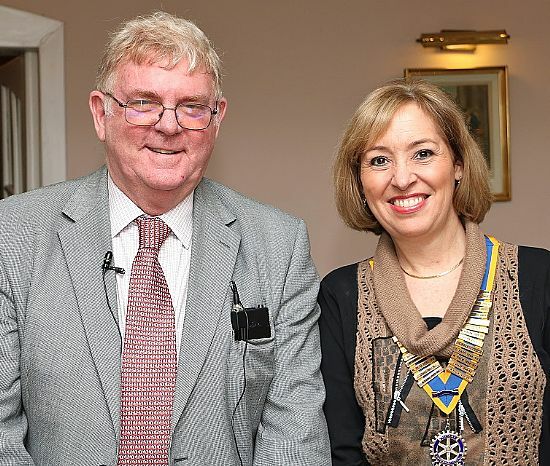 Gill, shown with Rotarian Bob Thomson, explained the work of Crossroads which is a care support group. Gill manages some 49 staff members providing respite care for patients in their own homes and gave many examples of the processes involved in providing such a wide range of support. Such relief allows people to be supported on hospital visits, essential shopping trips or just support at home. The work is necessary for people who do not receive full time care.